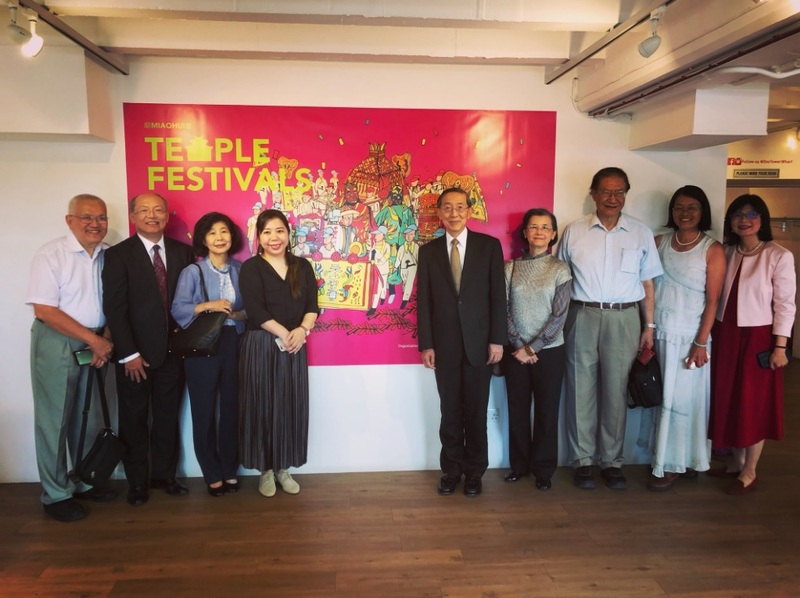 The “Taiwan Temple Festival & Folk Culture Exhibition” showing Taiwan’s ancestral Mazu culture officially opened yesterday (June 28) at the Gallery@OXO on the south bank of the River Thames. This exhibition was also selected as part of the London Festival of Architecture. The Taipei Representative Office in the United Kingdom held an opening cocktail party and guided tour on the evening of the 28th, which attracted over a hundred domestic and international guests. Taiwanese craftsmen carefully replicated the iconic religious imagery, from building a to-scale palanquin and fortune telling machine to intricately embroidering flags and designing deities. They also prepared a scroll (approximately four metres in length) detailing the roles of those who take part in the procession, and what their actions symbolise. The exhibition received praise from the audience due to its use of technology to introduce Taiwanese culture. In addition to displaying traditional equipment, the show features a modern multi-media interactive technology set up including an interactive billboard, virtual reality headset, and video recording. Representative Mr David Lin of the Taipei Representative Office in the UK attended the opening of the exhibition, and noted that being on the Thames riverside, it is an easily accessible location for tourists and members of the public to learn more about Taiwan. Taiwan’s rich religious culture is evident nowhere more-so than in its many temple festivals, which include ancient ceremonies, and showcase how spirituality has been ingrained in the lives of Taiwan’s faithful over the centuries. Among these festivals, those dedicated to Mazu, Goddess of the Sea are the most widely practiced. In fact, Mazu’s Annual Pilgrimage Procession is not only an important cultural event in Taiwan, but has also been designated as one of the most impressive religious events in the world by the Discovery Channel. The “Taiwan Temple Festival & Folk Culture Exhibition” is open to the public from June 28th to July 8th, 2018, Monday to Sunday from 11am to 6pm at the Gallery@OXO (Barge House St, London. SE1 9PH) The exhibition has toured across Europe over the past few months, visiting Holland, France and Germany.